To celebrate World Read Aloud Day, grab a book, invite a kid or two to your lap, and read. Will you hear this reading call? 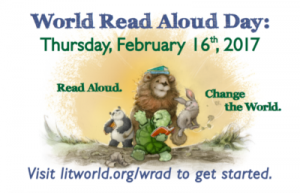 Will you read aloud today? This is World Read Aloud Day! Say them, say them, loud and clear. Say aloud the words instead. Should you? Could you? Yes, of course. Read aloud with lots of force. Oh yes, even outer space. Far and near, up and down. On the farm, and in the town. We are reading all together. This is World Read Aloud Day. Reading from a book of choice. Lots and lots, we shall read plenty. Poem and story, yarn and tale. We’ll read aloud; we will not fail. On a face, do you see the smile? Stay right here and give your ear. Read Aloud Day is full of cheer! 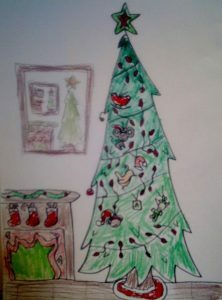 (by Barbara Allisen aka Mrs.
Fun Christmas Eve Traditions for Kids – What Are Yours? 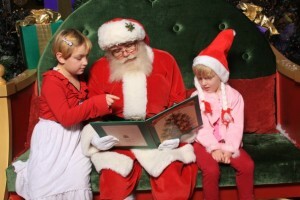 Finally, the day is almost here and it’s time for fun Christmas Eve traditions for kids. Some might be generations old, some new and unique for your family. Around the world, kids leave cookies and milk for Santa and a carrot for the reindeer. With eight reindeer and Rudolph, maybe they take turns eating the lone carrot. Maybe Santa shares the cookies with them or takes a few back for the elves. 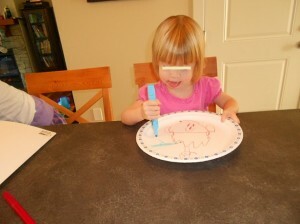 A tradition in our house is to leave them on a special plate the kids have colored. Since seeing this a few years ago, we use a paper plate each year and the kids use crayons and markers to decorate it with their best design for Santa. Many Christmas Eve traditions center around food. On a radio call-in show, there were so many different ones. One family always had oyster stew and another had lasagne. Not just main dishes, but special desserts. A friend mixes pudding and whipped cream with torn bits of cake and tops it with cherry pie filling. Whether you do the same menu or a new one, kids enjoy being part of the action in the kitchen. 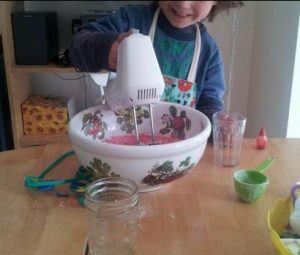 Is there something your child can mix, stir, roll-out, or wash? Being in the kitchen with the adults means kids feel like part of the grown-up group. While we think this is work, from a child’s perspective it’s fun and they feel included. Opening one present of new pajamas is a tradition for many families. After reading about the “Jolabokaflod” or book flood in Iceland, we’ve decided that sounds like a tradition for our family. For a warm, cozy evening people give books on Christmas Eve, then curl up by the fireplace with the books and cups of hot chocolate. We don’t have a fireplace but can turn on the tv and watch a burning log. What better way to share and enjoy the bedtime stories. Whatever your family does, these fun Christmas Eve traditions for kids will echo in their memories in years to come. What are yours? Treats are for eating but this reading books Halloween treat is wonderful for sharing, snuggling, listening, singing, and enjoying, even the scary parts. There are so many wonderful Halloween books for kids it’s hard to decide. We mix some new ones with some old favorites. It’s okay if a book is a little bit scary when snuggled on a lap. What sound do chickens make when they are afraid? 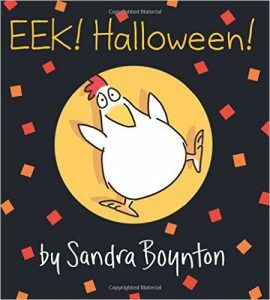 Sandra Boynton’s Eek! Halloween tells the story of a flock of nervous chickens. The chickens see some typical Halloween sights just like we do and they feel what we do. But, we don’t usually see animals dressed up do we? 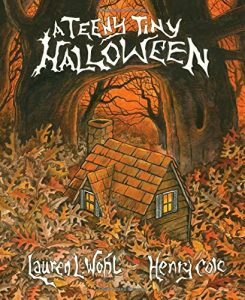 Another book a teeny tiny bit scary is A Teeny Tiny Halloween by Lauren L. Wohl and Henry Cole. The text almost has its own voice. The words teeny tiny are written in very small type. When reading, we can show kids how those words are so little and whisper them. The words fall, fall, fall, are like leaves but falling on the page, not the ground. Voices can fall too. One of the critical connections that kids need to make for learning to read is that the squiggles and lines are words, like the ones we speak. The printed words hold meaning the same way spoken ones do. This is something the brain figures out from experience, that’s why it’s so important to read lots and lots and lots of books. Reading is a daily vitamin brains need. Making cookies like the teeny tiny woman in the story would be meaningful too, for brains and tummies. 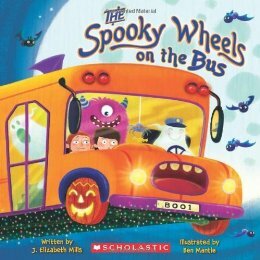 Get ready to read and sing the next book, The Spooky Wheels On The Bus by J. Elizabeth Mills and Ben Mantle. At Halloween, the things on the bus do not make the usual sounds nor look the same. As for the passengers, who do you think would ride a spooky, Halloween bus? Before reading, talk about that with your child and then see if you guessed any. This gets kids really involved with the book on a personal level. 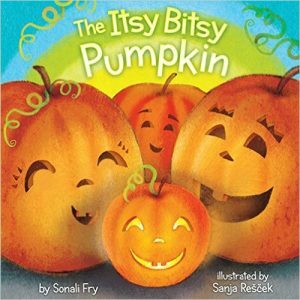 Another book to sing is The Itsy Bitsy Pumpkin by Sonali Fry and Sanja Rescek. A pumpkin is way too big for a water spout. Also, it has no legs to climb like a spider. How can a pumpkin move? Kids might have an idea. They could try moving like that too. There’s a part in the book about a goblin with stinky feet. You can check your child’s feet to see if they smell. Maybe give them a tickle too. Take advantage of the opportunity when reading books to kids to play and have fun. This encourages children to develop a positive and eager attitude when it comes to books, so important for learning to read. 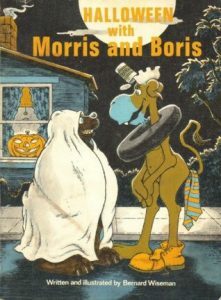 Halloween wouldn’t be the same at our house without this reading books Halloween treat: Halloween With Moris and Boris. Bernard Wiseman’s book is so well loved we’ve had to repair it multiple times. Moris the Moose doesn’t understand Halloween so Boris the Bear tries to explain. Moris still gets quite mixed up and sometimes Boris has to keep his temper. But the two friends enjoy themselves. Your local library likely has a selection of Halloween books for kids but any titles are a reading books Halloween treat. After all, isn’t reading a sort of magical trick?